Frederika Steen (or Freddie to friends) is a seasoned refugee advocate; but that's not her only qualification: she's also a former Immigration Department employee. When the Howard government was forced to open a full Parliamentary inquiry into Australia's Migration Act, the former DIMA staffer and Migration Worker wrote an extensive submission. Ms Steen wrote what is in many ways an indictment during her period as a volunteer for the Brisbane-based Romero Centre. The submission could be read as argument for the almost complete failure of the administration of the Migration Act under the Howard government's cruel set of ethics. 21 October 2005: Marion Lê OAM testifies to the 2005 Senate Inquiry into the Migration Act - "My conclusion, after the last 30 years of working ... is that in the last few years it has developed a culture of denial, suspicion and active destruction of human beings. It absolutely defies belief that people can be that cruel to another human being." Thank you for an opportunity to raise a number of weighty issues relating to the operation of the Immigration portfolio and its legislative base. I hope the Committee will take a wider view than the Migration Act and consider also the need for domestic legislation to better govern the onshore processing of asylum seekers as distinct from its selection of immigrants and refugees and its management of the entry and departure of people. Like many Australians, I yearn for a clear statement of the values and civil liberties we as a people claim to have and which should ensure that we treat all people with equality, humanity and respect for their dignity, including strangers seeking refuge and safety. In the almost 50 years since the Act was drafted, language and terminology have changed greatly and the portfolio responsibilities for immigration and settlement have significantly changed. It is an ever changing culture which demands the proactive management. As part of the Committee's preparation for this Inquiry, I encourage members to physically handle and examine all the legislation and regulations relating to migration and the guardianship of children, and ask why it is so complex. Immigration has remained a federal responsibility for more than a century and requires regular updating. Terms and definitions must have precise meaning for today's world. This submission is my personal submission, prepared in haste. I know that many of the people with greatest knowledge of what regularly goes wrong with the administration and operation of the Act are too busy to prepare detailed submissions. This is particularly so of migration agents and lawyers and volunteer advocates who are currently undertaking pro bono work for asylum seekers and refugees through the complex appeal processes which can and do take years. I applaud them for their commitment to justice. My submission includes views and experiences of many volunteers I work with and have networked with around Australia and reflects some of the issues of refugees on temporary visas with whom I have worked for the past four years at the Romero Centre in Brisbane. Most volunteers are too tired, and refugees too intimidated to prepare submissions. I have a personal and professional interest in successful settlement. I am a first generation immigrant, a child of a post war family which emigrated from the Netherlands in 1950. My community involvement with refugee settlement goes back to the late 1970s and the significant achievements of the Indo China Refugee Association in Canberra. I have been an active member of the Dutch Australian community in Canberra and served on the ACT Multicultural Education Committee, the Canberra TAFE Council and Chaired the Multicultural Advisory Committee of the ACT. I am a retired Immigration Officer with a wealth of experience in settlement services. My last position was that of Chief Migration Officer in Bonn/Berlin, 1997-2000. I am currently a Committee Member of the Multicultural Development Association in Brisbane. The Migration Act 1958, its regulations and guidelines are clumsy instruments not readily accessible to the people of Australia and difficult for a lay person to understand. The amendments to the original legislation including the significant 1989 changes and regulations undermine its effective and accurate use. The Committee should consider the need for a rethink and rewrite for today's world. The Regulations intimidate the user by their number and complexity. The balance of authority appears to be sliding towards Regulations rather than law. Ministerial guidelines appear to include whatever the Minister or the Prime Minister say in public and leaves great scope for varied interpretation and imprecision. Exactly what guidelines does a decision maker have about the weight to be given to the legislation, to Regulations, to legal precedence and to what the Minister or Prime Minister says? The process should be transparent and guidelines comprehensive. Many amendments and constant additions and changes to often highly technical regulations confuse meaning, and may be a major contributing factor to the poor administration of law and regulations by delegates whose training may fall far behind the rate of change. The codification of migration law always creates pressure, because circumstances change and can never be completely anticipated. The DIMIA website lists 19 legislation changes between February 2003 and July 2005, but not the number of changes to the Regulations. Can they be simplified? A "plain English" Migration Act is needed which works from principles. The Act and complementing Regulations should be accessible to the people. As relatively unskilled officers may exercise extraordinary powers governed by the Regulations which are not subject to parliamentary debate, Parliament's oversight of those Regulations should be increased, directly or indirectly. The perception that public servants make the rules, not Parliament needs to be addressed. Alternatively, the Committee may want to look at the effect of too much codification and consider restoring some discretionary powers to public servants at senior levels of expertise. Significant public expense could be saved through a shorter process which would be equally if not more just than the current one. 7. Asylum seeker, refugee or migrant? The Migration Act and Regulations govern most of the operations of the Department of Immigration including the determination of refugee status for asylum seekers who arrive at the border both with and without visas. The meaning of the terms "asylum seeker" and "refugee" in the day to day operation of the Act is confusing when considered against the UN Convention definitions. It seems that "asylum seeker" is equated with "illegal immigrant", with an absence of any notion of a person fleeing persecution and seeking protection. Is Australia not bound by international conventions? Australia seems to have redefined and narrowed what the term "persecution" means to create its own definition of refugee. Can two definitions coexist? Or should Australia withdraw its signature from UN Refugee Convention? The last wave of boat people from Iran, Afghanistan and Iraq were overwhelming assessed as genuinely fleeing persecution and many now live among us, on permanent visas. Yet they are stigmatised as "illegals", "queue jumpers" and "not nice people" as a result of Government's use of misleading language and ill defined terms. If the Migration Act is not the appropriate Australian legislation to reflect and integrate the domestic implications of the international conventions relating to asylum seekers, stateless people, refugees, human rights, the rights of children etc signed by Australia, then where should this rest? What is the legal source for an immigration officer with authority over peoples' lives to take into account for example, that "Individual liberty is at the heart of our democracy" (Mick Palmer in his recent report) and that Australia treats people equally and with dignity and respect? It is self evident from the Palmer Report on the treatment of Cornelia Rau, let alone the devastating evidence of maladministration and injustice which the report on Vivian Solon will make public, that Australia as a nation needs to firm up and teach what its values are, and spell out a modern code of ethics. Where is it encapsulated that Australia abhors inhumane treatment and breaches of human rights ? Our previous good reputation on human rights has been called into question and negated by our treatment of asylum seekers since October 1999. The Committee should seek advice on the seriousness of this loss of international reputation, as it affects relationships, influence and commerce. The Migration Act 1958 and its amendments deal with immigration from a domestic perspective, in a context of national population building. In recent years migration policy and program is increasingly designed to achieve economic/financial advantage to the nation. In an interconnected world, a global perspective is needed and the existing culture of "keeping them out" has to be reconsidered. The morality of our policies is an issue for further consideration. The Act has clearly proven to be inadequate for the fair assessment and consistent and humane processing of asylum seekers, who present themselves on our borders to seek protection from further persecution. It fails to deal humanely with stateless people, whom it puts through the ordeal of detention rather than finding an appropriate solution. The Committee must explore ways to correct this. Regulations and criteria relating to the selection of refugees offshore for the refugee and humanitarian component (6 000 and 7 000 places respectively) of Australia's annual immigration program must not be confused with the criteria for the assessment of refugee status under the UN Convention. Australia's own selection of refugees for its immigration program is affected by considerations of "settlement potential" and links to Australia. Critics have accused us of "cherry picking" even from the most gut wrenching refugee camps in Africa. To our credit, we did take some of the overlooked long term Indochinese asylum seekers from the camps in SE Asia under the Comprehensive Plan of Action when closure of the camps became an imperative. This was truly a humanitarian act, not of self interest only. Assessing refugee status against UN Convention criteria is a very different process to selecting UNHCR adjudicated refugees for places in our refugee and humanitarian program. For the integrity of the refugee assessment process, the Committee should consider the merit of segregating the assessment process for asylum seekers - people who arrive and seek protection and safety - from the Immigration portfolio. Experience demonstrates that you cannot effectively codify refugee claims and that specialist judgement and discretionary decisions provide a better protection of human rights. The assessment task requires an international perspective, regard for international law and sound analytical and legal judgements which have nothing to do with "migrant selection" type thinking. Legislation covering asylum issues must differentiate asylum from migration. The Committee is challenged to find a better location for asylum processing with the underwriting of international law in domestic law. Delays in processing of detained asylum seekers' claims must be circumscribed and standards set of what is a of reasonable processing time. It is the unexplained delays - long delays - in decision making which have destroyed the minds of detainees and driven them to self harm and over the edge. For some the damage done is irretrievable and it has ruined their lives. The Australian experience has demonstrated that justice delayed is justice denied. The perception remains that in some cases delay was deliberate and encouraged in the culture of DIMIA which assumed or knew it was doing what the Minister wanted. What does the Committee think is reasonable time frame for a decision while an innocent man's freedom is denied? Case officers who make decisions on asylum claims appear to have a very technical, somewhat mechanical approach to the application of regulations, without confronting the humanity of the people making the claims. The mechanical approach is a by-product of the codification of migration law. In the context of large numbers of cases, officers may have experienced compassion fatigue and burn out, management issues which must be addressed. Regulations are unlikely to have anticipated the circumstances of the "boat people" whose numbers escalated to about 4 000 in a year, not a big deal compared with other countries of asylum. Drawing on the public statements of the Minister, the Prime Minister and other Ministers, some decision makers appear to have viewed the claimants as unworthy, fraudulent, illegal and not the sort of people we want in Australia. Officers seem to have been inadequately trained about their duty of care and their performance appears to have been inadequately supervised and evaluated. Bias is an issue. "Duty of care" seems to be a concept largely missing in the compliance and enforcement culture of DIMIA where the detention of asylum seekers is managed. Five years of anecdotal information and formal reports leads to the conclusion that for some Australians working with men women and children immigration detainees, asylum seekers/ refugees are not like us or equally human and can be treated as inferior and as non human. "Why do they treat us like animals in a cage/", a 12 year old said to us. The Committee should examine whether duty of care is the subject of specific training or simply a matter of the individual sensitivity or awareness which an officer may or may not bring to their role as the Minister's delegate. Better management of the caseload of refugee claimants is needed to shorten the delay in finalising a case. It is not clear whether administrative and management guidelines exist that that include case audits and reports against expected timelines. Delays which appear to be mischievous may of course just be plain mismanagement or the lack of articulated management between DIMIA and the appeal bodies. The turn over of staff - an indicator of morale - has not always been accompanied by detailed handover of case files and the Committee should recommend that management be improved. The administration and operation of the Migration Act must be subject to the effective and credible management of complaints. The Palmer report has identified this as a major weakness in current culture and management. This may need to be external - an Immigration Ombudsman. At present, most clients with complaints are intimidated from lodging them. I regretfully say "often with good reason". They have no confidence in the integrity of the system to receive and process their complaint fairly and without prejudice to their application. Indeed, it is difficult to know how to lodge a complaint, particularly for those with limited English. A minority of complainants in the know, elevate their complaint to the office of the Commonwealth Ombudsman. The Committee could ask for an analysis of complaints to the Ombudsman, and of those complaints investigated by the Ombudsman, which may prove instructive in recommending an appropriate independent complaints management system for DIMIA which can deal with the bias and poor practice and resolve complaints in a professional manner. The living conditions imposed on asylum seekers who are based in the community must comply with human rights. They don't. There can be up to a hundred or so asylum seekers in the Brisbane area who have no entitlements to accommodation, income support, employment, medical care, education for their children. Where is the legislation to protect the human rights of men women and children in this situation? The present circumstances are an unacceptable breach of basic human rights. The burden of care is carried by the charity of good Australians who cannot bear to witness the gross inhumanity of government policy. Consideration must be given to the conditions attached to the 16 types of Bridging Visas and their compliance with human rights. Most Australians would be disgusted if they knew of the deprivation of basic rights of men women and children and ask, "How could this happen in my Australia?" With its lack of flexibility, the 48 day rule for claiming asylum in Australia is extremely harsh and leads to denial of basic human rights. The Committee should investigate the present regime of Bridging visas and their compliance with our national values, international obligations and observance of human rights. Australian domestic law must be clear on the right to seek protection from persecution, and spell out the obligations deriving from Australia's signing of the 1951 UN Convention on Refugees and 1967 Protocol. If not in the Migration Act, then somewhere else. The confusion generated by politicians and officials calling asylum seekers "illegal immigrants" or "illegals" and "queue jumpers" must be sorted out and their status as innocent people, not criminals, promulgated. Precise meaning of the terms used by Government must be defined in law and regulation. Miscarriages of justice in the assessment of asylum claims have resulted in long term detention and mistreatment of Afghan asylum seekers (until now) who were dependant on interpreters inadequately qualified and not accredited at the professional standard required to interpret life and death situations. Some were ethnically biased against them and breached the interpreter code of ethics when they did not declare their inability to translate accurately the responses from people who spoke Dari or the Hazaragi dialect. Decision makers are believed to have inappropriately relied on interpreters for cultural, historical and language background, including opinion on the claimant's Pakistani or Afghanistani nationality. In 1999 most DIMIA officers would have had no knowledge at all of Afghanistan or the Hazara people. The proper adjudication of claims of persecution by a person seeking asylum cannot be conducted without the assistance of fully accredited and professionally trained interpreters in the correct language or dialect. Standards must be set and met to protect the course of justice. The right to an appropriate professional interpreter should be set in law. As a prerequisite, DIMIA officers undertaking interviews and deciding asylum claims must be adequately trained in the professional use of interpreters. Australia is a multi lingual nation, where an increasing proportion of the population has more than one language in addition to ubiquitous English. The Parliament of the people must reflect this in ensuring high recognition of language and interpreting issues in the operation of the Migration Act. The Senate should consider conducting its own review of the NAATI accreditation and professional standards of interpreters used by DIMIA, the Tribunals and the Courts in the processing of Afghan asylum seekers from 1999 until the present. It will find a shortfall of professionally trained and qualified interpreters in the language and dialect of a significant proportion of Hazara claimants and raise significant concerns about the integrity of the assessment process. Para professional status, without training is not professional enough. The Committee should determine for the future what is the acceptable standard of interpreting to protect the course of justice in asylum claims. The right to information and legal advice for asylum seekers should be encapsulated in legislation, and guidance provided on what constitutes appropriate legal advice. It should not happen again that people in detention in isolated locations like Woomera or Nauru were denied access to information which was integral to their claim of persecution and specifically that it was unsafe to return to the place of their persecution. Asylum seekers in Australia's care, no matter where they are geographically located, should have, as a matter of natural justice, the same rights to information, legal advice and interpreter services as those on shore, in Australian detention or in the Australian community. The political "Pacific Solution" which exploited the poverty of neighbouring countries can not be used to reject Australia's duty of care for the asylum seekers detained offshore on it's behalf. They are Australia's responsibility and taxpayers footed the bill for out sourced services. Refugees processed on Nauru and Manus Island must be given the same entitlements as onshore refugees. The treatment of asylum seekers in immigration detention has drawn intense and sustained criticism at national and international level on the grounds of breaches of human rights. There is a growing body of literature documenting the tragedy that is the incarceration of innocent people in Australia in conditions described as worse than imprisonment. At all times the Minister for Immigration was aware of the criticism and chose to ignore it. A petition was tabled in both Senate and House of Representatives before Easter 2003 asking that, as an act of grace, mandatory detention cease and refugees on temporary visas be granted permanent residence. Parliament was silent on the matter. It is a shameful episode in our modern history and Parliament must acknowledge its responsibility for letting it happen. The long term detention of stateless asylum seekers is unbelievable. Indefinite detention is obscene. If a Palestinian cannot be returned to the country of his birth or his parents' birth, surely Australia together with UNHCR can find a solution which does not compound the person's misery. Especially in the case of stateless people the presumption must be against detention. Peter Qasim should not have been detained for nearly seven years. Only a Royal Commission will provide the necessary protection for those still in detention, those on temporary visas and many with permanent residence status to tell the details of the abuses they have suffered while in the care of the Government. Given protection, they could help identify the persons who perpetrated criminal acts against them. A Royal Commission is needed to validate that wrong was done and to account for what happened. No reconciliation or healing will take place without it. I am aggrieved by what was done in my name and the name of the Australian people. Detention of asylum seekers must be reviewable, short term and of a finite length of time. This should be law. Parliament may need to lead a public debate on the value we place on individual freedom, a freedom Australians have died to protect. In the absence of negative advice, an asylum seeker should have the benefit of the doubt and not have his precious freedom taken away. A fair go. Legislation should make clear the value we place on the individual liberty of all people and safe guard unreasonable removal of that liberty. The benefit of the doubt should equally apply to asylum seekers. A review in the context of international law, and Australia's existing obligations, is needed of mandatory, and particularly indefinite detention of asylum seekers, especially of children and unaccompanied minors, as allowed by current interpretation of the Migration Act. Or what is habeas corpus? What are the rights of a child? Our independent judiciary should take the lead and the debate must include the Australian people. Should the Australian Constitution be revised? The practice in immigration detention of the solitary confinement of asylum seekers under continuous video surveillance is abhorrent and should be stopped. Change the name to "management unit" and it is still abhorrent. There is too much evidence of denigration and humiliation of detainees for reasons that are absolutely minor, trivial. Under the duress of deprivation of his liberty and pure hopelessness, a man smashes a bowl of sugar on the floor. This makes him a troublemaker and his behaviour has to be "corrected". He is locked in a cell, alone and suicidal, for four weeks. He needs help, not punishment. Immigration detention is a punitive correctional culture and totally wrong. It aggravated my friend's deteriorating mental health. It happened also to Cornelia Rau - and many, many others. It is still happening. The Committee must call for humane alternatives to treating damaged and dysfunctional people in detention with behaviour management of the sort now in place. 51. A reasonable fear of absconding? The Australian experience is that genuine seekers of asylum are totally compliant with the requirements of Government, because only the Government can give them the security of a new life. People who are refugees are highly unlikely to abscond. The fact clearly known to Government is that the vast majority of those who came by boat from 1999 onwards were refugees fleeing persecution and who have been granted permanent residence. They are law abiding people. The presumption of guilt was wrong policy. Immigration detention centres in isolated Australia are an expensive political ploy designed in the first place to (improperly) punish asylum seekers and deny their access to lawyers, advocates and community friends. In recent times, as asylum seeker numbers have declined, DIMIA has also accommodated over stayers and criminal deportees in Baxter which was purpose built for asylum seekers and on design plans which came out of correctional services models. The mix is inappropriate, especially for women and children. The location of places of detention should be guided by consideration of access rights and appropriate support services. Reasonable standards must be regulated around the release of refugees from detention and into the community. Inadequate notice of release, refused freedom of movement to farewell friends in detention, inadequate consultation about preferred destination, failure to give medical records to people in need of health care on arrival, inadequate travel arrangements for pregnant women and mothers with young children, inadequate reception arrangements and accommodation on arrival were the hallmarks of arrivals in Brisbane. It was mistreatment and unwarranted. Arrivals on a Friday were hardly conducive to appropriate arrangements being available. Temporary three year visas for fully adjudicated refugees are an iniquity and the legislation creating them should be rescinded. Permanent status should directly follow on the decision granting refugee status to an asylum seeker : a given. TP Visas were introduced in October 1999 to deter the arrival by boat of asylum seekers in large numbers, and so reversed the traditional Australian arrangement which gave permanent residence and a new life to a person who was found to have been persecuted and could not safely return to their own country. There is no proof that temporary status, as introduced, deters genuine refugees from fleeing. There is endless proof that temporary status creates disadvantage, hardship and perpetuates the insecurity of a person who has already lost so much. A Parliamentary Committee made an inquiry some years ago into the normalising of procedures for Special Benefits paid to refugees on temporary visas. Refugee support groups and advocates including the Romero Centre made submissions which detailed the very real disadvantage being experienced then. The bitter irony is that so many people granted only a temporary visa have on re interview, after three long suffering years, been granted permanent residence. They were not allowed to put down roots and have been discriminated against. They were refugees from the time they fled persecution, so why did the Government torment them so? At what human and financial cost to them and to our society? The direct experience of community based, community funded helping agencies like the Romero Centre in Brisbane is that the TPV had the effect of compounding the trauma, insecurity and grief of persecuted people in a very alien environment. It added to their persecution. It has generated as well as worsened the mental ill health, particularly depression and sleep disorders, in men women and children. It was cruel and unnecessary and served no positive purpose. The TPV created a two class refugee system. As if being a refugee is not enough of a life disadvantage. 62. Family policy? Whose family? In contradiction to Government family policy and the values Australians allegedly place on family, the TPV regime passed into law by Parliament in 1999 enforced the long term separation of refugees from spouses and children left behind. For some this denial of sponsorship entitlements has become a five and six year horrific separation from loved ones usually living in precarious circumstances. A woman with children is extremely vulnerable without her male protector and provider.This was not in the spirit of the UN Convention which Australia voluntarily signed. The refugee Convention is for family reunion, wherever possible. How could domestic legislation in relation to fully adjudicated refugees be applied in such an inhumane way, and in contradiction to how family policy and programs apply in other areas of Government? The inconsistency is blatant and must be corrected. Migration legislation should be consistent with other domestic legislation and policy, including that governing the Human Rights and Equal Opportunities Commission. Family means every family, including a TPV refugee family. Does Australia need a Bill of Rights to signal to ourselves and the world what we value? I think so. The TPV restriction on re entry after travel outside Australia is a breach of the UN Convention. Protection, even temporary protection, should continue to apply to a person who wants to travel to a country where, for example, his dependent family has found safe haven or is living illegally. The legal basis for this restriction on the travel of refugees on TPV must be rescinded, and the link to the obligations under the UN Convention clarified. Never in Australia's history have basic settlement services been denied to refugees, that is until October 1999. Denied access by their temporary status to the best adult English learning program in the world, refugees from Iraq, Iran and Afghanistan were left to founder in the Australian community. It was a fundamental disrespect for the well being of the Australian community as well as of needy individuals. Many were illiterate and uneducated as a direct consequence of religious and ethnic persecution and few spoke any English. In Brisbane there was no "ethnic community" to assist them with settlement basics like accommodation, medical help, employment, education and training. Most of the more than 2 000 "landed" in Brisbane, relocated to Sydney and Melbourne. Unaccompanied Minors fall under separate legislation, the Immigration (Guardianship of Children) Act 1946- which gives the Minister for Immigration full guardianship responsibilities for asylum seeker and refugee children. It was drafted with British child migrants in mind, not refugee children. Dereliction of duty and conflict of interest were frequent allegations made about the Minister, who was both their guardian and jailer. We gave evidence about some of the neglect and mistreatment which is documented in the 2004 Report of the HREOC, "A Last Resort?". While under18 years of age, a child had the right of sponsorship for reunion with immediate family. Temporary visa status has robbed them of the right. The three and more years on temporary visas have now excluded young men with permanent residence from refugee family reunion with widowed mothers and siblings. This is a tragedy which can be put right with the granting of the right to retrospective sponsorship to those who came as Unaccompanied Minors. Please consider. The comparison with New Zealand policy is painful: boys rescued by the Tampa (2001) have already been reunited in New Zealand with their families. It is to their great personal credit that most refugees on temporary visas have survived the years of limbo and separation from family, have worked, paid taxes, obtained Australian skills and qualifications and made Australian friends. The Senate should note that additional provision must now be made in settlement services to support refugees' often difficult reunion with family members after long separation, and to assist in practical ways the development of communities and leadership to facilitate successful integration and real settlement. Given the probable miscarriages of justice among so called "failed asylum seekers" still in detention and subject to deportation, great caution must be used in all cases. The perception that persons who have failed to persuade decision makers of their claims of persecution and their fear of return are therefore fraudulent claimants, must be challenged and corrected. Their claims may simply not been of a high enough order of persecution needed to gain Convention refugee status, or meet Australia's own version of what constitutes persecution, but nevertheless qualify them for what in the Australian refugee regime is "humanitarian status". A humanitarian visas can be granted where an asylum seeker has demonstrated compelling and compassionate circumstances and "refugee-like" claims of persecution. There is a humanitarian visa fall back position for "benefit of the doubt" cases, where return is more than likely to be dangerous. The probability that some of the claims failed because of mistakes must be taken into account. Mistakes did happen in interpreting, because of post traumatic shock syndrome, because of ethnic bias, official harassment, lack of access to current country information and informed legal advice and the debilitating effect of long term detention on a claimant's capacity to represent their own interests. Children were not accompanied at interview by a legal guardian. With the Act, regulations and existing review and appeal processes constructed in such a way that the well founded allegations of significant errors in interpreting in the original interview cannot be revisited or investigated, a gross miscarriage of justice is likely in a case known to me. The technical reasons for this non sense is incomprehensible to me, when the effect of wrongful deportation can cost a person their life. Truth and justice matter. Process is the means not the end. There is no doubt in the minds of tens of thousands of informed Australians that the detention environment in Port Hedland, Curtin, Woomera and Baxter has brutalised and permanently damaged asylum seekers who have committed no crime. I say permanent damage, drawing on the comparison with World War 2 survivors of civilian and military internment who never fully recover. The detention of asylum seekers has vicariously traumatised employees in the centres, DIMIA officers as well as refugee supporters. Evidence of damage done to people has been extensively documented by professionals and given to Government, which has knowingly continued to detain people. The length of the detention has compounded the mental cruelty and the damaging effects. This treatment in itself constitutes compelling and compassionate circumstances, and some would argue are sound grounds for legal compensation. Freedom in the community- not forced deportation- should be the norm for asylum seekers who have no criminal records and about whom there are no security concerns predating their detention. Detention is not warranted where Government cannot present a convincing and detailed account that a returnee to the country of their claimed persecution will be safe. In Australia we would not usually force victims of crime to return to the scene of the crime. Voluntary deportation from the detention facility in Nauru was an absolute fraud. 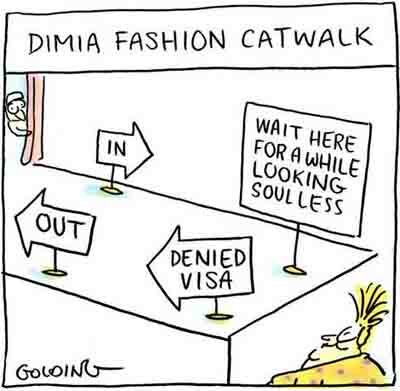 Evidence from detainees and workers and letter writing friends in Australia chronicle daily threats from DIMIA and other staff that if the voluntary package is not accepted "we will send you home anyway, without the money". The deteriorating mental health of men living in harsh conditions, separated from family and despairing about their conditions and their future intimidated some hundreds (406?) into returning to their country of origin. Dr David Corlett's recent book "Following them Home" tells the sad stories and the consequences of forced deportation of men from Australia and Nauru. The Edmund Rice Centre has documented other similar tragedies. The doubts raised about the efficacy of forced return of men who have held out for years in detention precisely because of their fears, must be reconsidered. Detention broke the spirit of these men and destroyed their lives, something that no Government has the right to do to people. Country information gathered by DFAT is used by DIMIA decision makers to test the claims of asylum seekers. Most of it is intelligence gathered second hand . DFAT officers are not resident in the very areas from which most deportees have fled in fear. Human rights are not always a priority in DFAT reporting, which could be enhanced to take account of the life and death decisions being made by DIMIA users. Given the reliance placed in refugee determination on this and additional information about conditions in the country, DFAT should be given the task of monitoring the return of all deportees and be required to report on their safety after return for at least a year. If deportation to countries like Iran and Afghanistan is Government policy, Australia has a civilised country's responsibility to confirm that the former detainees who were refused refugee or humanitarian status are safe from persecution. Ethnic communities in Australia from those source countries are closely and anxiously watching and evaluating Government credibility in dealings with their former country. Forced removal of detainees involves the outsourcing of services to security contractors, airlines and charter companies. Do the specifications in the contracts make clear that detainees are not criminals and that their human rights are to be respected? Are the contracts supervised? Complaints have been made about unnecessary force and chemical restraint but with the disappearance of many of the subjects of this abuse, and the fearfulness of those still here, formal investigation does not take place. The abuses are more than perception. There have been breaches of human rights and breaches of Australia's obligation on refoulement. Shame .There is no public faith that complaints would be independently investigated by DIMIA, or that proven complaints would lead to any reform. My knowledge about health and other services in detention comes from many refugees released into the community from 2001 until the present, from advocates, migration lawyers and agents, interpreters, teachers, medical professionals and friends who have visited people in detention centres around Australia. I have not visited a Centre. I am aware that in the wake of the Flood Report and many complaints, the facilities and services in detention centres improved over time. What exists now, was definitely not there in 2000. Access to people in detention by journalists is still restricted. Former employees at the centre are silenced by the terms of their employment, but a few whistle blowers have added to the public record. The asylum seekers who were imprisoned behind the razor wire in the desert or on an island from which there was no escape were not criminals or terrorists. They were and are no threat to Australia's security or public health or sovereignty. Refugees who came by boat and were then detained on arrival in Australia have experienced extraordinary suffering in their lives, both in the country from which they fled and on a journey that was perilous. They lived in fear of death, knew death intimately and possessed amazing survival skills. They dreamed of a better future. Detention was a shock, a betrayal of the dream. The reception by ACM and DIMIA staff was sometimes hostile and ugly: "Go home, Australia does not want you here". Numbers replaced names. The dehumanisation began. Healthcare in the early days of detention centres rarely surpassed the sparing despatch of Panadol and later the more regular despatch of anti depressants and sleeping pills. Some say pills beyond their expiry date. There was no assessment of trauma, let alone treatment. Inadequate interpreting services almost excluded the possibility of treatment or good diagnosis. Dental care was mostly missing. Many refugees say they have never been to a dentist. Fee for service for visiting dentists did not enhance the service. Extraction was a primitive solution to toothache, sometimes without anaesthetic. There were no effective measures to prevent ill health or mental disease. Detention was the disease. Adequacy of services aside, what really destroyed people's health was detention itself. The absence of freedom, of personal liberty diminishes a person and destroys their well being. Hope keeps a person motivated, alive, dreaming of tomorrow. Detention of more than three or six months unravels a man's hope, his soul. Detention without an end in sight is what drove them to despair, to the edge, and over the edge. Detention did and does much more than damage the health and mental health of asylum seekers. It destroys people and eliminates self esteem. Institutionalised living too has a cumulative effect of disempowering them, robbing them of decision making in their own lives. Parents were deskilled. Children were not parented. The best services in the world are of no consequence when a person's life is dominated by the loss of freedom and hope and overtaken by a growing and overwhelming sense of injustice and hope- less- ness. The issue here is not "were health and other services adequate" but what is the effect on innocent men women and children of short or long term immigration detention and if it is bad, what are the more humane alternatives. It is the human impact that matters, not how good or bad the services were. The system of detention centres in remote locations managed by contractors steeped in the culture of prisons for criminals had the effect of denying and obstructing Australian public assistance to people in immigration detention. The distance from major population centres made it very difficult for fellow country men to visit them. Visitors were despised and often treated with disdain. Telephone facilities were inadequate to maintain let alone develop relationships and provide much needed emotional support. Communications with those in authority was fraught with problems and obstruction. Detainees were often entirely and humiliatingly dependant on the charity of friends. Immigration detention has proven to be a toxic environment for human beings with a cumulative impact on physical and mental health. The Committee should monitor the adequacy of health services in the community for the survivors of immigration detention now in the community and ensure that mental health funding in particular increases to accommodate seriously ill people with limited English. Health services must be complemented by adequate interpreter where no professional help is available in own language. The transfer of detention services from Australian Protective Services to a for profit contractor, Australian Correctional Services, was not accompanied by essential safeguards about the quality of service required. Staff did not understand and may not have been trained to know that those detained were not criminals. Some staff were belligerently racist and anti Muslim. The culture promoted was a prison culture insensitive to government policy on multiculturalism and apparently oblivious to international conventions on human rights. The account of life as a detention officer published by Sandy xxxx, Queensland based raconteur and entertainer, is revealing. DIMIA supervision of the contract to manage remote detention centres and services from a Canberra base was always likely to suffer from a huge culture gap. It was new territory and very unfamiliar and there was no expertise to support effective management. Out of sight was largely out of mind. Outsourcing was somewhat confused with washing ones hands of a matter, and relinquishing responsibility. A hard copy of the submission, attachments and enclosures in in the mail today.